The Rayong Condo Chain, Royal Rayong Condo, VIP, New World Condo and Rayong Beach Condos are all located on a 15 km. stretch of sandy beach perfect for swimming, sunning, walking or relaxing! In addition to swimming, you can take surfing or stand up paddle lessons at the Rayong Surf School located just off the beach road near the Nice Beach Hotel. Water taxis or speed boats are available for trips to near-by Koh Samet Island. Take a boat trip with snorkeling to the islands Koh Kudi, Khu Mun Nai or Koh Talu. The islands all belong to Koh Samet National Park. Take a day snorkeling trip on the MS Sunflower headquartered in Ban Phe. Tennis players can look for the tennis courts behind VIP Condo on Mae Rumphueng Beach Road. Book your court at the VIP reception desk. Conveniently lit for night playing. Bicycle riding is popular along the beach road. Bicycles are available for rent at Thanom Kitchen, Pulom’s restaurant as well as for sale and rent in Nai Rai and Ban Phe. Exercise enthusiasts can look for Tabata Interval Training on the beach in front of the Royal Rayong Condo on Monday, Wednesday, and Friday mornings at 7:00 a.m. There are many Thai & Western food restaurants along Mae Rumphueng Beach road. Right in front of the Royal Rayong Condo is the delectable Pizzeria Sophia. Delivery available! Popular Thanom Kitchen is on the road between the Royal Rayong Condo & VIP Condo. Thanom also serves food and drinks on the beach. The German Restaurant, located about ½ km. west along the beach road in front of the Victory View Condo, serves German food, burgers, beer, and the best potato salad in the area. Restaurant Gula Vagnan offers an outstanding beach bar-b-que buffet Tuesday and Thursday nights, 6:00 p.m. Look for the little cart on the Mae Rumphueng Beach Road, then head down to the tables and chairs on the beach! White Stones Corner is located a bit farther west along the road. Here, vendors sell various foods including bar-b-qued chicken and pizza. A great place to relax, fish, swim or watch the sunset! Excellent, tasty German food is offered at Pon’s Kitchen, 2kms up the road from the White Stones Corner, and at Zurberg Restaurant near Nai Rai. Directly to the east of the Royal Rayong Condo is Baan Chaan where you can buy drinks and snacks. The friendly owners also provide a very economical laundry service. Pama Resort, located a few hundred meters east along the beach road toward Ban Phe, offers Thai and Western food, also good coffee. In addition to the restaurant, Pama has a large, clean beach area. Order your drinks or lunch from the restaurant to have on the beach. A few hundred meters east of the Royal Rayong Condo, Chomlay Restaurant, located 90m. up a short lane off Mae Rumpheung Beach Road, features balcony drinks and dining. Their Wednesday buffet is 200 baht, however children less than 1 metre tall are only 100 baht! East of Chomlay Restaurant, Blue Tiles Restaurant is always a favourite for Thai food. Just past Blue Tiles, Pulom Restaurant is an economical & highly recommended. Pulom also rents reliable Motor Bikes. Blue Talay Restaurant serves some of the best Thai food in the area! Or if in the mood to start your day with something different, try their "American Breakfast." 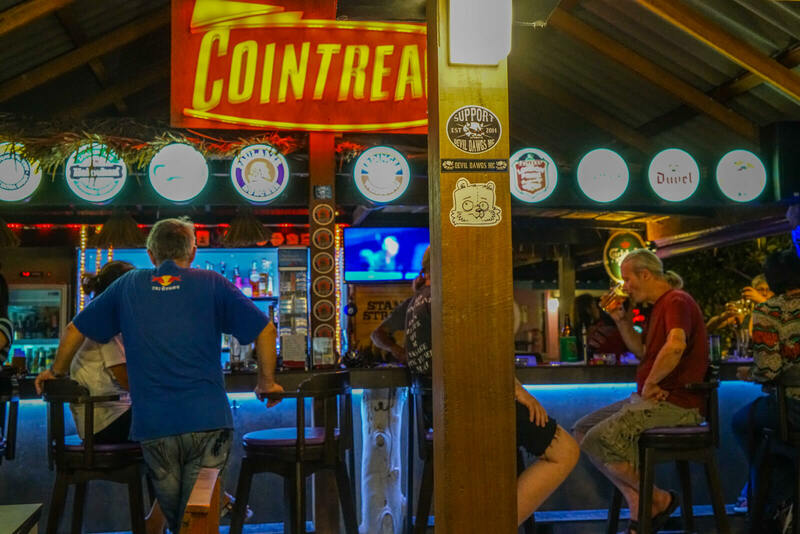 The ever popular Chayita Restaurant, located east of the Royal Rayong Condo near the Kan-Tah-Lay resort, offers Thai & Western food & also serves food on the beach. Across the street from Chayita, the economical Joy Beach Thai food vendor is always delicious! For a bit of a change, the Purple Haze Bar & Indian Food (circa Jimmy Hendrix) located near the Nice Beach Hotel boasts American and very good Indian food. The music in the bar is amazing! Bob’s Bar, located near the Fisherman’s Village offers Friday Indian Curry Night -- all you can eat buffet for 150 baht! Nois Café & Restaurant, a Swedish restaurant located about 3kms. east around the corner on the beach road towards Ban Phe, is known and loved for their authentic Swedish meatballs. For a fine dining experience, try the Tamnanpar Classic Resort & Restaurant 3 kms. north of Nai Rai. This large one-of-a-kind wooden restaurant serves delectable Thai food plus a large variety of exotic dishes, including Kobe beef, crocodile & alligator! Enjoy a guided tour of the entire resort before or after your meal. In addition to various vendors selling t-shirts, souvenirs, food, coffee and fruit along Mae Rumpheung Beach Road, there are several convenience stores - one right beside Chayita Resort & Restaurant, one beside Kan-Tah-Lay-Resort and two others near the Nice Beach Hotel. There is a 24 hour Tesco Lotus Express convenience store across from the temple in the village of Nai Rai which is located 3 kms. along the road through the jungle next to VIP Condos. A fresh produce market is held in Nai Rai on Tuesday and Saturday evenings, starting about 3:00pm. This market offers an excellent selection of fresh fruit and vegetables as well as fish & poultry, sushi, fresh spring rolls, pad thai, mango sticky rice (yummy), clothing and small household items. Nai Rai has two excellent pharmacies, several laundry services, two scooter repair shops, a bicycle shop, various produce and household goods stores as well as several restaurants. The town of Ban Phe has Big C, Makro and Tesco Lotus grocery stores, three 7-Eleven’s, a Monday and Thursday night market, plus many fresh produce and fish stands. There are also clothing and souvenir shops plus dozens of local restaurants. One small shop, Petra’s, across from the main street 7-Eleven, has all types of imported dry goods, frozen foods, breads, cheeses, sliced meats plus a healthy selection of wines and liquor. If Petra doesn’t have what you want, she’ll get it for you! Rayong City has three major shopping malls – Tesco Lotus, Laemtong and the new Central Festival Mall – as well as a large variety of small stores and vendors. You will find all major Thai banks – Bangkok Bank, Kasikorn, Krungthai, etc. - offering full banking services in both Ban Phe and Rayong City. There are two ATMs located on Mae Rumphueng Beach Road, one in front of the convenience store near the Kan-Tah-Lay Resort and the other near the tourist police Station at Hin Khao Corner. There are also ATM’s at Big C and Tesco Lotus in Ban Phe and at many locations in Rayong City. There are good masseuses on the beach across the street from the Royal Rayong Condo and VIP Condos. There is also a massage studio next door to the Nice Beach Hotel. Nai Rai offers several good massage studios. There are also massage studios and spas in the shop level of the Rayong Beach Condo building. The province of Rayong boasts many fine golf courses within driving distance from the Royal Rayong condo and VIP Condochain. A van load of avid golfers leave the two condos once or twice a week, usually Tuesdays and Fridays, for a day of golf. Join them! The Emerald Golf Club and Silky Oak Country Club are two more fine courses. When you are tired of swimming & relaxing, the Koh Samet National Park, complete with observation telescope, is located just around the curve of Mae Rumpheung Beach Road. Look for the gates. The Rayong Aquarium is located farther along towards Ban Phe. Take a guided tour of the local organic fruit fields at Supphattra Land near Rayong City. Sample the fruit and have a salad lunch made with organic lettuce! For a change of pace and scenery, visit Koh Samet Island. There are four ferry piers in the town of Ban Phe with ferries departing to the island on regular schedules. Koh Samet Island, a favorite destination of Thais, offers shopping, plenty of beaches, water sports and many fine restaurants! Motor scooters & bicycles can be rented at many locations along the beach road as well as in Ban Phe & Rayong City. The Royal Rayong Condo has four bicycles available for condo guests’ use. Ask at the reception desk. Taxis are also available. Look for the posted signs. Little trucks, known as songtaews, are available on the beach road for transport into Rayong City. Stand on the road and flag one down! A ride is only 20 baht, regardless of where you hop on/off. Motorcycle taxis are available for trips to Ban Phe. Transportation to and from the airport or for a shopping trip to Pattaya or Bangkok can be arranged by asking any of the condo staff or local businesses. Interested in buying a condo or property in Mae Rumphueng? I can help. Please contact me or browse current Mae Rumphueng condos for sale.